Today we have a special "Real Nursery" featured from a reader in Australia. 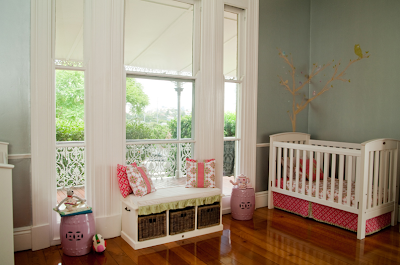 Carla Hazzard has an adorable vintage inspired nursery of her twin daughters to share with us today. I was after a vintage style to suit the era of our home but wanted a modern twist. 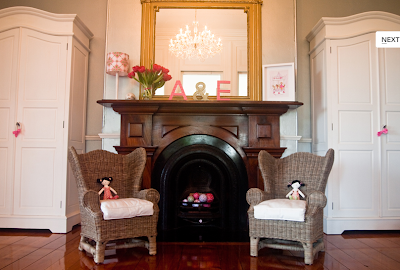 I asked Leah from Little Maison to help me with the styling of the room. The matching french armoires, followed very closely by fabric for the bedding. The cots were hand-me-downs from our first child. I love looking back at the fireplace. The room is so beautifully balanced with the armoires on either side of the fireplace and I love the cute matching rattan chairs. We moved into the house when I was 28 weeks pregnant with the girls and had no time (or desire...who wants to paint when you're heavily pregnant with twins!) to repaint the room. The previous owners used the room as a dining room. I think the silver walls and the chandelier really work with the scheme and I wouldn't change it. Probably one thing that hasn't worked out as well would be the decals. 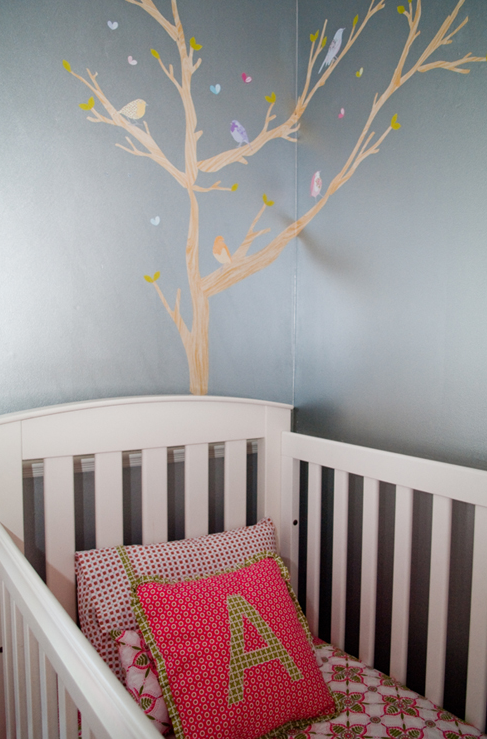 I love the tree decals but being so close to the cot has its issues...they now have no tree trunks and are missing quite a few branches due to two sets of very busy little hands. Other than that, I love how everything has turned out. If you love the bedding and pillow fabric in this nursery, you can get a similar look yourself with Carla's line of children's bedding called Habitat Baby. 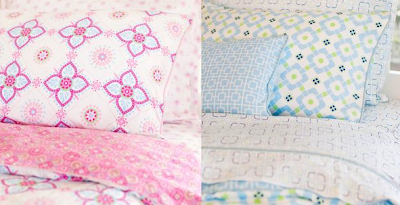 The prints are sophisticated yet the bright colors make the bedding more juvenile and playful. 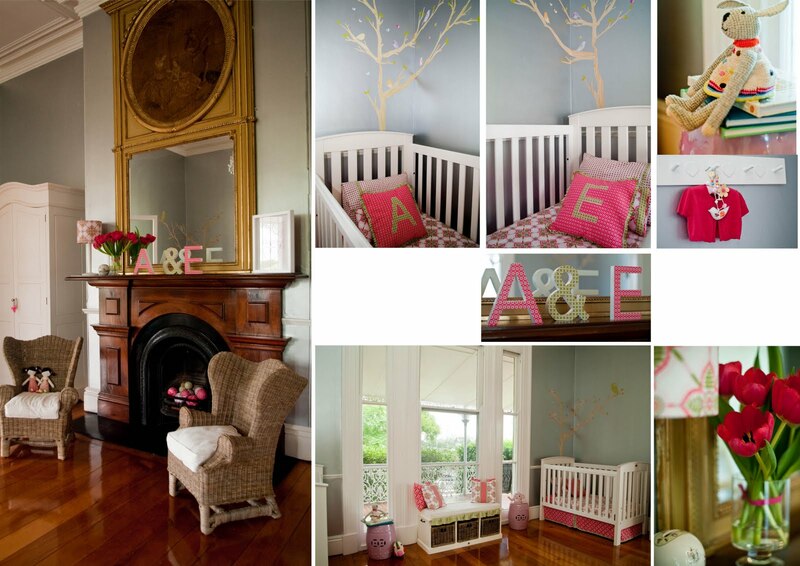 Her on-line store not only sells the beautiful bedding but also room decor and gift items for children. Thank you for sharing your nursery with us today Carla! 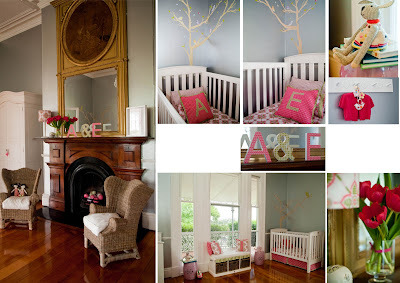 Photography of her nursery is credited to Love Bites and additional images can be seen in the portfolio section of Little Maison. So adorable...thrilled to find and follow your blog today!! This is beautiful! Wondering where to find the adorable pink chinese garden stools? "anonymous" I bought the ceramic stools from Little Maison. They are beautiful.